Writing began after the band returned from a 50+ date North American tour, opening for Black Flag in summer 2014. The band spent time road testing the brand new material over the course of two European tours and scattered US dates in 2015, before settling back in to Martin’s historic BC Studio (in Brooklyn, New York) by years end to start recording. On the second night of the MAN BITES DOG sessions, there was a break in after hours at the studio (located in the old American Can Factory, built directly upon the Gowanus Canal in 1886) gear was stolen, including all of the band’s guitars. Recording continued with borrowed instruments and a new sense of purpose; the raw, primal, intense music created was profoundly influenced by these circumstances. The decision was made to bring guest Matt Darriau in to provide saxophone on a handful of the MAN BITES DOG compositions. Darriau is a reed specialist who’s spent time building a stellar reputation in New York’s downtown jazz scene. He’s a member of the Grammy Award winning ensemble The Klezmatics, Balkan rhythm quartet Paradox Trio, duo Disastro Totale (with Yuri Lemeshev of Gogol Bordello) as well the free-improv trio he and Cinema Cinema formed in 2013, known as CCMD. Cinema Cinema first met Martin Bisi in 2012 amid the aftermath of Hurricane Sandy. Bisi, whose BC Studio was located just a few blocks away from the band’s rehearsal studio, was walking through the streets overwhelmed by the destruction he encountered when he came upon guitarist/vocalist Ev Gold and drummer Paul Claro clearing ruined instruments and amps from the remains of their annihilated practice space. The three immediately struck up a friendship and kept in touch thereafter. Within days of the disaster, the band experienced an amazing outpouring of support from their friends, fans and fellow musicians who donated money and equipment, bought records and merchandise. This allowed Cinema Cinema to refurbish and replace gear, and — with a few borrowed pieces – start playing live again within two weeks. In 2013, the duo would rebound to perform some 75 shows, including a handful of dates opening for Black Flag, as well as their first European tour, opening for Bisi. Martin had kept in contact post-hurricane and the groups (Bisi has an experimental post-rock band) shared a few bills in Brooklyn which led to the European touring and ultimately to Martin’s producing the band’s 2014 full length, A Night at the Fights. Additionally, Cinema Cinema would go on to contribute music to, as well as appear in the critically acclaimed 2014 documentary, “Sound and Chaos: The Story of BC Studio” alongside luminaries such as Michael Gira, Lee Ranaldo, Bill Laswell and many more in an effective and compelling ode to Martin and his 30+ years of work at BC. Cinema Cinema takes its name from a scene contained in the 1992 Belgian film: “C’est Arrive Pres De Chez Vous” aka“Man Bites Dog”. After years of explaining that detail, the duo felt compelled to further affix it to their story by naming the new album after the film. 2016 was spent putting the finishing touches on the LP, returning to the EU for a summer tour of festivals and a playing a handful of East Coast dates in the USA. Ev and Paul will look to couple this release with their customary relentless touring in 2017 to bring MAN BITES DOG all over the world. 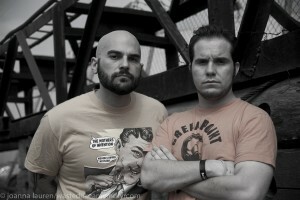 Cinema Cinema was formed in 2008 by cousins Ev Gold (guitars/vocals) and Paul Claro (drums). Debut album, Exile Baby, was released late that year and the boys determined to book 100 shows to promote it in 2009. Touring that extensively taught the band countless invaluable lessons; helped to further instill a serious minded work ethic and ultimately pushed the album to crack the CMJ Top 200. By middle 2010, the duo had crafted a double album’s worth of new material and headed to the Arlington, VA-based studio of legendary DC punk recordist Don Zientara (Minor Threat, Fugazi, Bad Brains, Bikini Kill, etc.). The sessions yielded close to 80 minutes of music eventually released as the three song Shoot the Freak EP in 2011, followed by the Manic Children & the Slow Aggression album in 2012. That same year they opened for Greg Ginn & The Royal We (SST Records) on several national tours including one through the Southwest that saw them stopping over at SST’s Texas studio (dubbed: Casa Destroy) and recording an extended session with Ginn sitting in on bass yielding some 90 minutes of dark, intense, heavy music. Since forming in January 2008, Cinema Cinema has performed over 400 shows across nine countries, including 40 of the 50 states in the USA.